Camp Gitchigomee is blessed with an outstanding natural setting. To the west, Sandstone lake laps up on the sandy beach shoreline, while bass lurk in the weedbeds offshore, and bald eagles, kingfishers and loons hunt for dinner. Spectacular sunsets are not uncommon. On the peninsula to the north, there is a trail loop where many boreal plant and animal species can be seen and heard. To the east, Sandstone Creek flows gently along through pencil reeds and white water lilies; bullfrogs, ducks and the occasional moose like to hang out there. The forest to the south provides habitat for songbirds, woodpeckers, rabbits, groundhogs, squirrels, and other creatures. We have been visited by painted turtles, great blue herons, garter snakes, weasels, mice, and even a lynx. 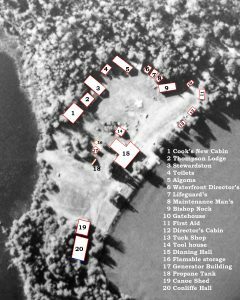 The layout of the camp buildings can be seen on the site plan. There are three large camper cabins, several staff cabins, a First Aid Post, the main dining hall/kitchen, and of course the flush-toilet biffies. The property committee has been working hard to adhere to AODA accessibility standards. New ramps and doors have been installed in Smedley Lodge (the Dining Hall) with plans to update accessibility to cabins by 2025. The campfire pit is centrally located , surrounded by two shade shelters and a small stage. 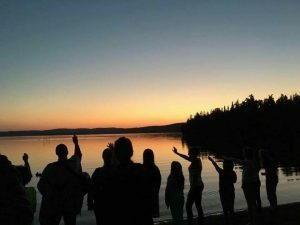 At the north side of camp, we have a canoe & craft shed, and a recreation hall/chapel. Operational buildings include the generator shed, flammable storage shed, the Tool shed, the water pump enclosure and the woodshed. There are two large fields for land games and archery, and a children’s play centre next to the beach.